At the death of Longhena in 1682 the building was not yet ended, Architet Antonio Gasparri ended the works as per the original Project, The works ended in 1710, it is clearly a classic Sansovinian, its elements were revisited and redone to create a new armony. 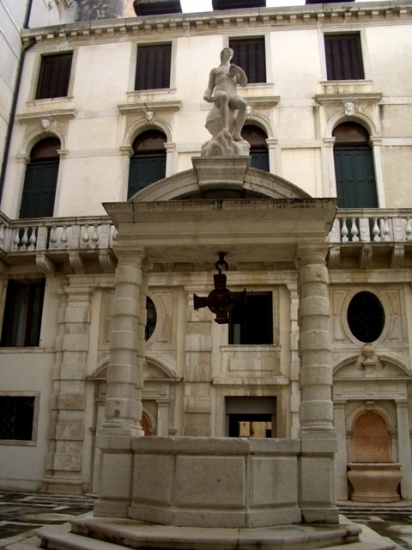 After many ownership cange the palace was donated to the Venice City Hall by Duchess Bevilacqua, the only condition was that it has to be dedicate to the exhibition of the emergent artists. The Majestic beauty of the baroque façade, enriched by various statue, does not find correspondence with the interiors. Sadly, during the years, a big part of the riche decorations were destroyed or ruined, only few frescos remains (also one by Tiepolo) and nothing else. The hall is wide and massive ke all the centrasl part of the building and seems to be build around the waterhole, all around there is a terrace and a portico. Now Ca’ Pesaro host a Modern Art Gallery (1st and 2nd floor) since 1902 here there are many civic operas of inestimable value by Klimt, Chagall, Kandinsky, Klee, Matisse and Moore. The third floor is dedicated to the Orient Art Museum that host one of the biggest collection of Japanese art of the Edo period (1615-1868) collected in Asia by Enrico Borbone during his trips at the end of XIX century.